The seaside city of Carlsbad in San Diego County has so much family fun to offer: a world-renowned theme park, farm to table dining, beautiful beaches and boutique hotels. 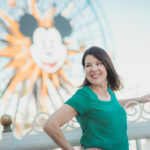 Day Trips Traveling Mom (and San Diego native) visited for the first time and shares her 2-day itinerary of the best things to do in Carlsbad with kids. Located 35 miles north of downtown San Diego, the city of Carlsbad offers so much in the way of family-friendly entertainment. I’ve visited LEGOLAND many times. However I’d never ventured into the city of Carlsbad. This includes Carlsbad Village, a very walkable area with shopping and restaurants. And the 7-mile long beachfront is so beautiful, I’m already planning my next visit! Here is my 2-day Carlsbad itinerary, tailor-made for families. West Inn & Suites is located right between the beach and LEGOLAND, which makes it an ideal location for anyone wanting to explore all that Carlsbad has to offer. This boutique hotel has 86 guest rooms and 36 suites. King-sized beds are outfitted with the most comfortable Egyptian cotton linens, down duvets and gigantic pillows. It’s a family friendly hotel for parents who enjoy being pampered while traveling with children. 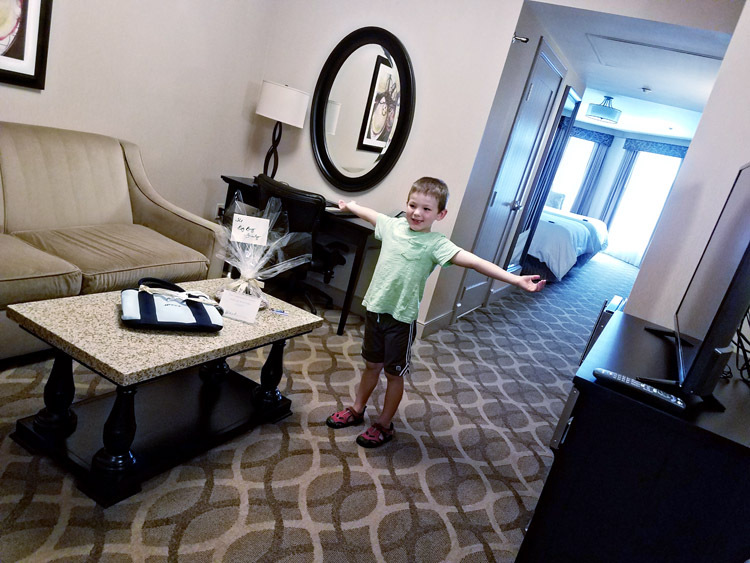 My husband and I enjoyed the roomy suite, with the extra seating area, desk and television so we could stay up after the kids were asleep. I felt so welcomed at the West Inn & Suites. Pets are welcome here too. The hotel features an on-site dog park, in-room treats and patio dining. There is no resort fee at the West Inn & Suites and parking is complimentary. 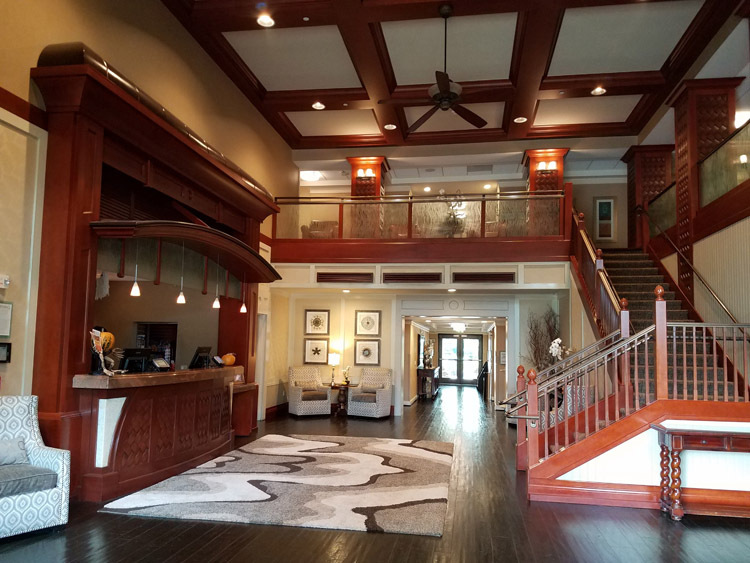 Amenities here are fantastic – not only are there two restaurants on-site, an exercise room, and heated pool but a full hot breakfast buffet is included with your stay. In the evening, warm cookies and milk are served in the lobby (you can bet we loved that). Guest services even offers sand toys, chairs, umbrellas and boogie boards for use at the beach! TravelingMom Tip: A complimentary shuttle service is available for guests within a five mile radius. Just perfect for getting you to and from the beach, LEGOLAND or Carlsbad Village with dining and shopping. How to get there: LEGOLAND California is a quick 2 miles from the West Inn & Suites. The West Inn & Suites shuttle will take you directly to the park (and avoid the parking fee!) If you’re set on driving, head southeast on Avenida Encinas toward Cannon Road. Use the left 2 lanes to turn left onto Cannon. Continue on Legoland Drive to your destination. LEGOLAND is a full-day park, with rides and attractions, hands-on LEGO building areas, Miniland U.S.A. and the SeaLife Aquarium. The attached water park is closed in the off-season and has limited weekend-only openings outside of summer, so be sure to check online before packing your swimsuits with you. I recommend purchasing the Reserve-a-Ride pass, especially if you are visiting during a busy season or on a weekend. The Reserve-a-Ride will allow you shortened line waits. If you have older children with you, start your day by moving through the Park towards the right after you enter the Park (towards Ninjago World and Technic Coaster). Attractions for younger children (like Storybrook Boat and LEGO Duplo play area) are towards the left of the front entrance. You’ll have many great options for lunch at LEGOLAND, depending upon your interests. We like the Japanese-style stir-fry at Wok N Bowl Ramen made fresh right in front of you. TravelingMom Tip: Pre-purchase your LEGOLAND Carlsbad tickets at a discount via our TravelingMom affiliate link through Get Away Today. How to get there: Bistro West is located next door to West Inn & Suites. From LEGOLAND, either take the hotel shuttle or reverse your drive from the hotel earlier that day. 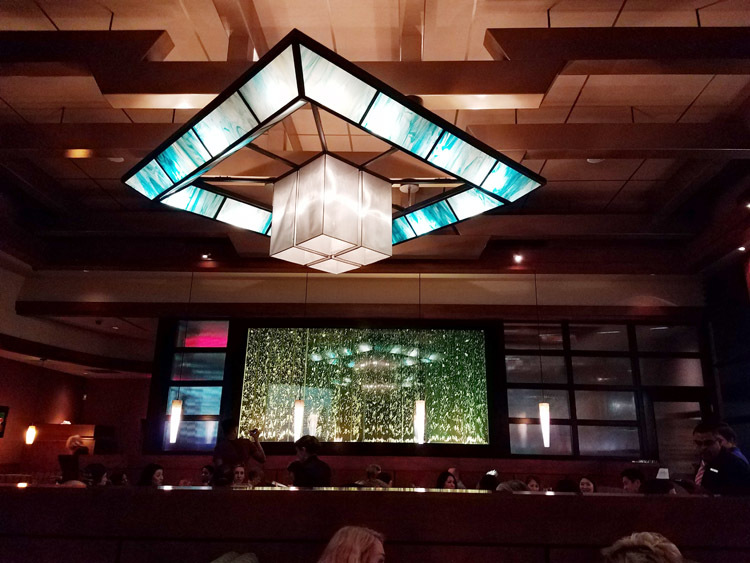 With its elegant dining room and stunning ceiling lights, you’ll feel very sophisticated dining at Bistro West. However, Bistro West is more chic than stuffy and the farm-to-table menu offers comfort classics like chicken pot pie and stone hearth baked pizzas (alongside a vast wine menu). You can’t miss the highlight of the room – The water-filled bubble wall, which gently changes colors while you watch. I had a hard time deciding on a meal because everything on the menu sounds incredible. Most of all the herbs, fruits and vegetables used on the menu at Bistro West are grown at The West Farm, located just a few miles away. Farm to table, for sure. We tried several appetizers, including the crispy beef spring rolls and Bistro ahi tartare. Both were beautifully plated and so flavorful. TravelingMom Tip: My 5-year old was with me and no amount of cajoling could stop him from ordering the chicken strips and fries. There are other options on the kids’menu including filet mignon and grilled salmon for children more adventurous than my son! Starting day two in Carlsbad, you can choose to enjoy the complimentary hot breakfast at West Inn & Suites or indulge in a cold pressed juice or smoothie at Choice Juicery. From there you’ll be bike riding, music making and more! How to get there: Located just over 2 miles from the hotel, head southeast on Avenida Encinas toward Cannon Road. Turn right, then right again on Carlsbad Boulevard. Turn right on Carlsbad Village Drive. Location will be on the left. 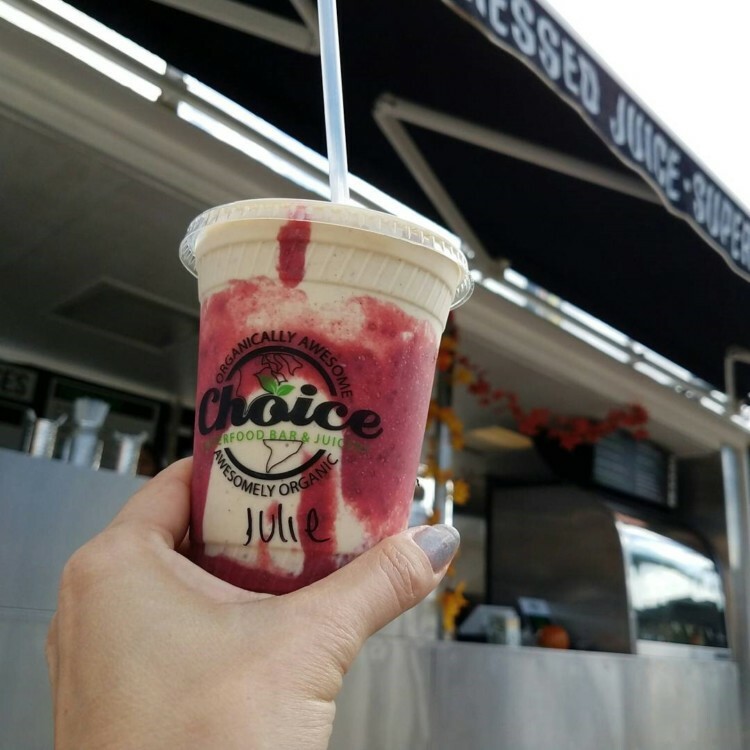 Choice Juicery looks like a cute trailer set in a yard with faux grass, rocks and picnic tables. Guests step onto the porch to order, then chill on the lawn until their order is up. I went with a cold pressed juice, the Dawn Patrol with carrot, orange, ginger and turmeric. It had a slight bite, which I loved alongside the creamy carrot. You know who else loved it? My toddler, who quickly commandeered it as her own and sipped half of it before I had a chance! I also ordered myself a PB&J smoothie with sprouted vanilla almond milk, date, eco-protein, banana, peanut butter, and Choice raspberry chia jam. Delicious and filling, just right for fueling up before a long day. TravelingMom Tip: Prices are a little steeper than what you might be used to seeing for smoothies and juice (around $10 each). However everything on the menu is gluten free, dairy free and plant based. Choice also offers bowls with toppings like granola or fresh berries. How to get there: Walk one block west from Choice Juicery, on the opposite side of the street. While Pedego Electric Bikes Carlsbad has mostly electric bikes, it also rents regular bikes. I have to be completely honest. The last time I rode a bike was in the mountains of the Czech Republic and it didn’t go so well. I was nervous about riding a bike in Carlsbad, since I had both my 5-year-old and my toddler with me. The bike shop attendant suggested a regular beach cruiser with a place for my toddler to sit in front. My son was given his own small bike with training wheels. We were all fitted with helmets and sent on our way! The bike itself was fantastic, very comfortable and easy to maneuver. I was able to pedal (even uphill) without any trouble or strain. The bikes at Pedego Electric Bikes Carlsbad are well cared for. You can even purchase your own in the shop and they’ll ship it to you! TravelingMom Tip: If allowing your youngster to ride his own bike along the busy road makes you nervous, check out Pedego’s bikes with attached trailers and seats for small kids. How to get there: Located 10 minute’s drive from Pedego Electric Bikes. Drive east on Carlsbad Village Drive and merge onto the I-5 South. Take exit 47 at Palomar Airport Road. Turn onto Armada Drive. Location is on the right. The Museum of Making Music is all about the instruments. While learning about and hearing music is cool, playing it yourself is the best! My 5-year-old was itching to get his hands on some of the tester instruments to try them out himself. He had the opportunity to play a mandolin, electric guitar, gong, slide guitar, drums and a harp guitar (something I’d never even heard of!) There were actually many instruments I’d never seen before inside the Museum of Making Music, including a harmonica that had scrolls similar to a player piano. 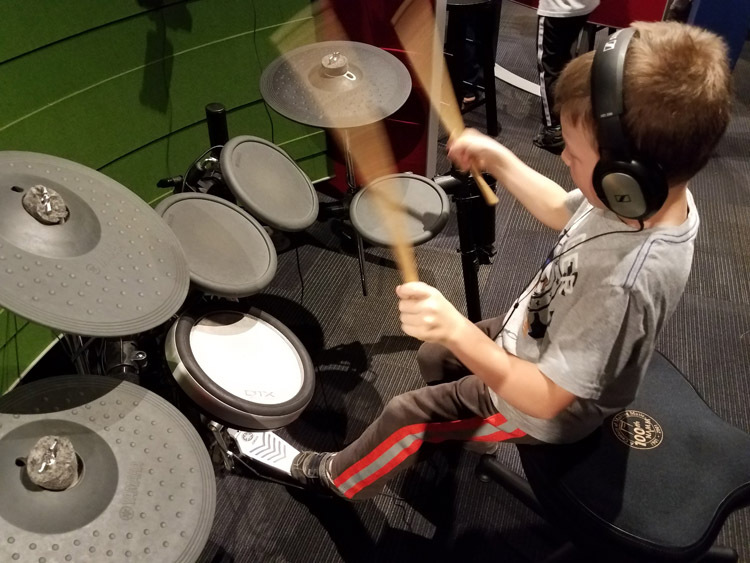 Leave plenty of time at the end of your visit for free play, where there are dozens of available instruments for strumming and drumming! There is also a gift shop to purchase your own music makers. TravelingMom Tip: The Museum of Making Music opens each day at 10am (except Monday, when it’s closed). Plan to spend about one hour exploring this unique museum. How to get there: Head northwest on Armada Drive toward Fleet Street. At the traffic circle, take the 2nd exit onto Legoland Drive. Turn left on Cannon Road. Turn right onto Carlsbad Boulevard. Turn right onto Carlsbad Village Drive. Pizza Port is on the right. This popular local chain is known for its pizza and craft-brewed beers. I love pizza and so does my 5-year-old. However while I really wanted to order one of the Pizza Port Originals, we went with straight-up pepperoni to appease him. Next time I’m ordering the Pizza Carlsbad with pesto, mesquite grilled chicken, sun dried tomatoes, artichoke hearts and feta cheese. Feeling adventurous? Try one of Pizza Port’s Anti-Wimpy Pizzas like the BBQ Bacon Cheeseburger Pizza. Or this Original flavor, the Pizza Solana with shrimp, clams, onions, bell peppers and mushrooms! The menu also offers salads, baked chicken wings, and mac & cheese bites. 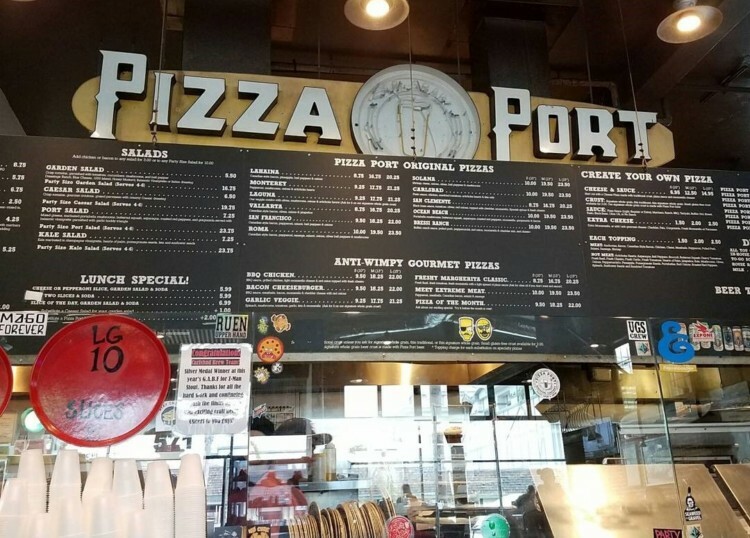 TravelingMom Tip: Pizza Port is really busy with the lunch crowd. Have one person grab a table while the other orders and fills drinks. There are five Carlsbad beach locations to explore. Some do not offer lifeguard services or restrooms, or are for mostly surfing. the two locations below are best for families. You’ll find lifeguards on duty, public restrooms and showers at both locations. 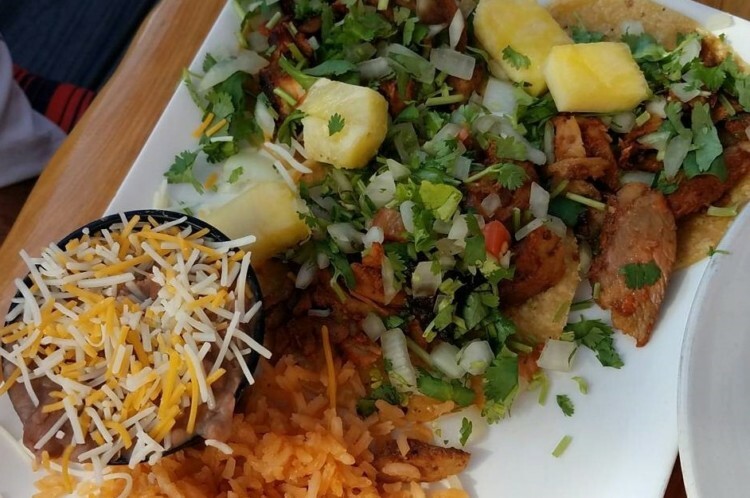 How to get there: Head northeast on Carlsbad Village Drive. Turn right on Roosevelt Street. Continue onto Magnolia Avenue. Turn right onto Jefferson Street. Turn right onto Tamarack Avenue. How to get there: Head northeast on Carlsbad Village Dr. Turn right on Roosevelt St. Continue onto Magnolia Ave. Turn right onto Jefferson St. Turn right onto Tamarack Ave. Turn left onto Carlsbad Blvd. Take the Carlsbad Blvd S ramp. How to get there: From either beach, head north on Carlsbad Blvoulevard. Turn right onto Carlsbad Village Drive. Restaurant is on the right. If you’d rather not dress up for dinner and are looking for a relaxed, casual California atmosphere, look no further than Senior Grubby’s. When in San Diego, one must order Mexican! Portions at Grubby’s are large and delicious. And of course, Mexican food tastes great with a beer. Grubby’s offers beer on tap as well as craft bottles. We were also delighted by the soda machine. Stubborn Soda is Fair Trade with all natural flavors like Pineapple Cream Soda and my fav, Lemon Berry Acai. TravelingMom Tip: Don’t miss the self-serve salsa bar. But trust us, the “hot” is really hot!